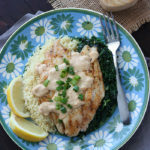 Catfish fillet is seasoned with a zesty combination of herbs and spices, skillet sauteed, then topped with a zesty and creamy Creole mustard sauce. Three weeks ago, The Husband went on an all guy’s fishing trip and came home with a cooler full of fresh catfish. As soon as he got home, we bagged everything and put it in the freezer to ensure the freshness. Catfish can be a little tricky. If it’s not fresh, it can start to develop a very fishy flavor. And I don’t like my fish to have a fishy flavor. But since this went from pond to freezer within a matter of hours, the flavor of this catfish was neutral and light, enhanced by the lemony freshness of the sauce. First, rinse your fillets under cold water. Then pat them completely dry with paper towels. This allows a nice brown crust to form on the outside of the fish while you are sauteing it. Brush both sides lightly with a little olive oil. Typically, I would just season my catfish fillets with a little Cajun seasoning. But I have found that is a little too spicy for my kids’ palate, so I’ve switched to my homemade BBQ spice rub. It has a similar flavor profile as Cajun seasoning, but without the heat. I really like sauteeing fish in my cast iron skillet. It heats quickly and I always achieve a nice color. A cast iron skillet that is seasoned properly is better than Teflon, so I never have to worry about my fish sticking to the pan. The sauce is very similar to a remoulade sauce. I whisked together mayo, plain yogurt, ketchup and Creole mustard with fresh lemon zest and spices. I stirred in just a little chicken broth to thin it out to make it easier to drizzle. It’s the perfect accompaniment for any firm white fish. This sauce comes together quickly, but it could be made ahead of time and stored in the fridge. The fish only required a few minutes in each side in the skillet. The entire meal comes together quickly, making it a perfect for a busy weeknight. 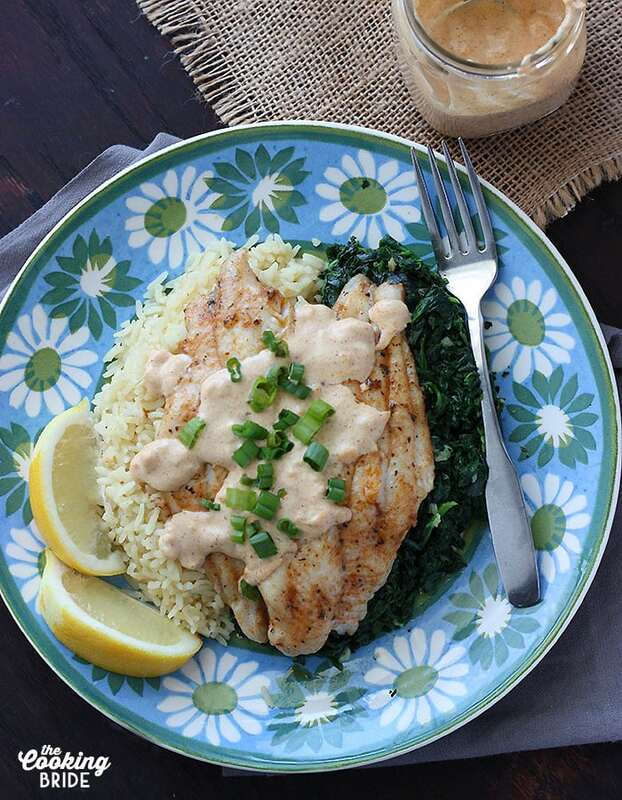 Catfish fillets are seasoned with a zesty combination of herbs and spices, skillet sauteed, then topped with a zesty and creamy Creole mustard sauce. Whisk together all ingredients in a small bowl. Cover and refrigerate until ready to serve. Brush both sides of the catfish fillets with the olive oil. Place fish in a grilling basket and grill approximately six minutes per side, or until fish flakes easily with a fork. Drizzle Creole mustard sauce over the fillets just before serving.